Just like the name implies these sessions will be available for you to bring your ideas, questions and quandaries and ask a Certified Trainer directly from Blackboard. The ins and outs of grading, extra credit, calculated columns, smart views, managing your gradebook and more. Using the new Blackboard mobile app for Smart Phones and tablets to connect with your courses. With the new Blackboard, comes new ways to present content to your students. 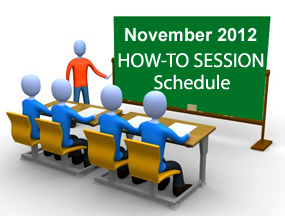 Find out about these new options by attending this session. Building your course has never been more convenient. Learn about the New Blackboard environment and how to build/organize your course. Find out about Blackboard’s new Notification system, and catch up with your old friends, the Blackboard communication tools. Learn how to assess your students with assignments, rubrics, tests, early warning system and the performance dashboard. Blackboard has a slew of new communication tools to play with: Blogs, Wikis, Journals and Voice Tools. Learn about how and when you might want to use them. Learn how the tests, test options and test questions have changed. Find out how to leverage your tablet device to help you teach and organize your work. 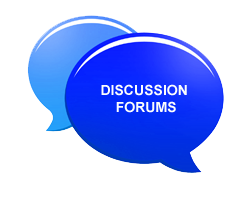 Moderating Posts in Discussion Forums? Now there is an ORIGINAL thought! As envelopes are pushed in the distance education arena, we are discovering some things that need to be addressed. Having taken a few online courses for my Master’s degree and in working with faculty in their courses, I’ve noticed a trend when it comes to some student postings in what are supposed to be well reasoned, interactive back-and-forth discussions. Students are waiting to see what their colleagues post and then creatively copy-pasting their own discussion board posts. Instead of doing the leg work of coming up with their own thoughts about whatever it is they are supposed to be posting, they are rehashing their colleague’s posts. There are thoughts as to why this may be happening, but that is subject for a different post. Assign a due date for the creation of discussion threads in response to your discussion question. Do NOT publish/moderate the posts until after the due date. Have a separate due date for replies to original postings. By following these steps, the students make their posts, completing the first part of the discussion assignment (the part when you want them to reply with their original thoughts) without being able to view the posts of fellow students. Then, when you open the discussion back up for reply the are free to build off of each others’ ideas and continue to interact. This does entail a little more work on the part of the forum moderator (professor, instructor, TA), but can really go a long way to ensuring the integrity of student discussions. This solution does not have to be utilized on every discussion forum in your course, but can be leveraged for when you want to ensure the student’s thoughts are original. *Some Learning Management Systems do not have the ability to moderate posts, so another solution may be in order. Kaltura has partnered with Blackboard to deliver a video application that opens up a whole new set of engaging teaching possibilities – from integration of lecture capture and video materials, to video assignments, and sharing of student and faculty video content, all fully integrated within the Blackboard Learn platform. Watch this video walk-through to find out more. Use the Upload Media Button to upload your video or record via a webcam. Once you have successfully upload/recorded your media click Submit. With the implementation of a new version of Blackboard comes a new method for course combinations, called Course Merge. Course combinations have always been available for faculty, however there were drawbacks. When an instructor is teaching more than one section of the same course where the content is exactly the same, it is often easier and more efficient to have one central course to upload materials and track grades. Previously, these combinations would be done through IT@Sam and one course would be placed into another – meaning the request needed to be made as early as possible in the semester and could result in the loss of some data. With Course Merge, a container or “master course” is created into which the combined sections, or “child courses” are placed, much like placing several small containers inside one large container. The instructor sees one master course and all child courses on their Blackboard page, but the students will only see the section for which they are registered – and the instructor need only update the master course for all sections to be updated. In this image, you can see that instead of combining all sections into one, “child courses” are placed inside a master. The master course is shown as well as the sections, which are listed as child courses of the master course. Course Merge can be done at any time during the semester, as no data is lost. Keep in mind that although you can access the individual child courses, any changes made therein will not be seen by students, only changes made in the master course. An orange banner will appear when accessing the child courses, alerting that any changes made there will not be seen and that changes must be made in the master course. 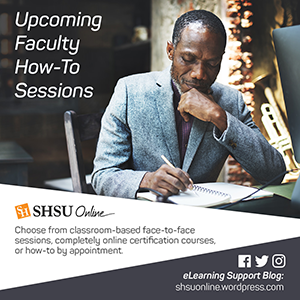 If you are interested in doing a Course Merge for sections you are teaching, please contact DELTA at blackboard@shsu.edu or call (936)294-4780.